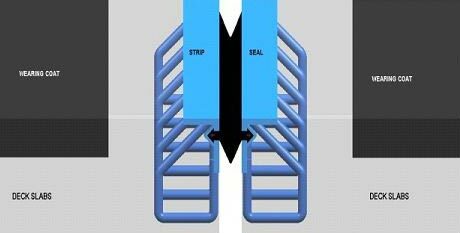 Strip Seal Expansion Joint System (Kanta Flex Single Strip Seal Expansion Joint) is based on the system that the Expansion Joint is built with the elastomer profiles between steel rails to absorb movements. This Joint Consist of Steel edge beams with web for holding the seal, anchorages and elastomeric seal. The working movement range of the strip seal will be + 80mm particular to the joint and + 40mm parallel to the joint. This type of Single Expansion Joint is recommended for moderate to large simply supported cantilever / Continuous construction having right, skew or curved deck with maximum horizontal movement upto 70mm. It is manufactured indigenously in accordance with the requirements of Ministry of Shipping Road Transport & Highways. Kantaflex compression seal expansion joint consist of armored nosing at two edges of the joint gap suitably anchored to the deck concrete and a performed chloroprene elastomer compressed and fixed into the joint gap with special adhesive blinder. The compression seal will cater for a horizontal movement upto 40mm and vertical movement of 3 mm. this type of seal is recommended for simply supported or continuous spans right or skew ( up to 30 degree ) Moderately curved with maximum horizontal movement not exceeding 40mm.